Employees are talking about your brand on social media - in fact, 50% of employees share about their company without any prompting. According to Statista, there are nearly 120 million full-time employees in the U.S. alone, meaning 60 million employees choose to talk about their employer online. The good news is that their message is overwhelmingly positive; the bad news is that all this employee advocacy is happening beyond your awareness. Employees share about your company on social media without training or any guidance on brand safe content. According Proskauer Rose LLP's Social Media in the Workplace: Around the World 3.0 survey, 90% of companies now use social media for business purposes - up from 60% a year ago. However, many business leaders are uneasy about asking employees to help attract new employees and new customers on social media. Businesses are stuck in this contradiction because they fear what employees will tell the world. When huge brands like Dell, IBM, Adobe, Pepsi and MasterCard have thousands of employees who have been trained to share brand-safe content, clearly this cognitive dissonance can be resolved. 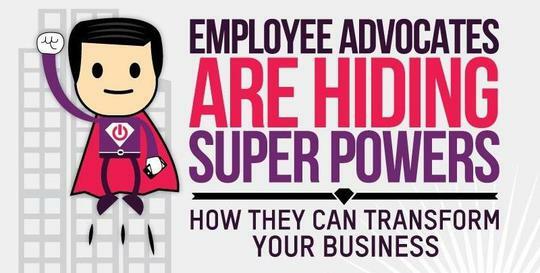 The key is to understand why employees would advocate for the company. What's in it for them? How do you make it feel natural for them to advocate? How can you motivate them to do it well? First, help employees understand what the company stands for. All people and particularly Millennials, who will make up 50% of your workforce in 5 years and 75% in 10 years, want to find fulfillment in their work and want their contributions make a difference in the world. However, the average American worker knows shockingly little about the companies he or she works for. According to Gallup's 2013 State of the Global Workplace, just 41% of U.S. employees know what their company stands for and what makes its brand different from competitors' brands. A sense of fulfillment is unattainable if you don't understand your company's own mission and why your work matters. Employee advocacy develops an understanding of the brand, and in turn, this produces a sense of pride in sharing. According to Gallup, Americans spend an average 47 hours of their week working - they want friends and family to know what they work so hard at and why it matters. This is why employees especially enjoy sharing corporate social responsibility initiatives like sustainable environmental practices, volunteering and donation programs. Even videos of employees working on the latest initiative, or a testimonial about a company that is using your product, can stoke feelings of dignity and gratification. Your employees want to share what makes them proud to work because it is core to their identity and sense of meaning in life. When social content recognizes individual employees and teams, they and their colleagues want to share. It's like giving a friend a big digital high-five. The social relationships within your company matter to people, and this is why recognition matters. Besides an appearance in social content, recognition can take many forms including acknowledgement from managers and executives. When executives re-tweet an employee's comments, shout out over Facebook or post a story about how one department just invented the next big thing, employees remember it and feel appreciated. Recognition helps employees remember that they are the voice of their company. If an employee helps to drive awareness, leads, purchases, new hires and key partnerships through social media activity, is that not a sign of an innovative, future leader? Why not look at social media as a proving ground for leadership potential? Social media is simply a communication medium, and when employees show command in its arena, they are really showing potential to lead others. The companies that see social media as a training ground for professional development will motivate employee advocates to their full potential. Acknowledging people with training opportunities, inviting them to lunches with executives, gathering high performers together and promoting leaders all demonstrate that employee advocacy is valued. Likewise, referral bonuses for employees who successfully share job opportunities on social media send the same message. Rewarding people for being outstanding connectors and ambassadors for a company just makes good business sense. Everyone in your organization knows that social media is important. It continues to be a frontier where the opportunities for employees to create value are largely untapped. When you train your employees, provide them with great content to share, help them cultivate understanding and pride, and then recognize their advocacy publicly and with advancement, they become an even more powerful asset. When you link social media to advancement, I promise you, employees will want to be trained and given tools to succeed. Social media is the arena where individuals can, through the power of their own voice, stand out on an enormous scale. An as an employer, what could be a better way to identify leaders who can really represent your brand to customers, partners, job candidates and the press? Empower advocates - help them discover deeper meaning and opportunity in their work - and they will power your brand.